Are you looking for an inexpensive and local twilight market, where you can find a wide variety of hand-made and home-grown products? If so, then the Quantin Binnah Twilight Market could be the solution. This is not your average, everyday market. It boasts a unique range of products and stallholders, as well as a relaxing and friendly atmosphere and of course it is held during the twilight hours. 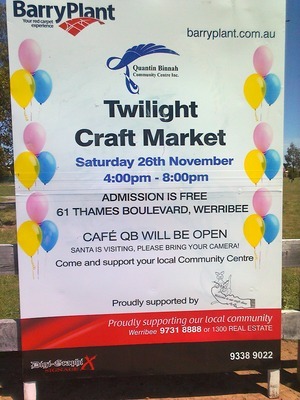 The market is held on Saturday the 26th of November 2011 at 61 Thames Boulevard, Werribee from 4pm to 8pm. As Christmas is just around the corner, you will be able to find that special present for that special someone, including kids and fur-kids. Santa will also be visiting, so make sure you bring your camera to get those memorable photos. 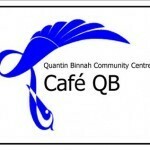 The Quantin Binnah Community Centre was opened in October 1992 and was named after the Canadian Indian term 'Full and Plenty'. Some of the local residents are volunteers at the centre and help to ensure it is maintained to a high standard. The purpose of the centre, is to meet the needs of the local community, encourage active community participation, to maintain government regulations, provide for the diverse community and continue to ensure local co-operation. Other than the twilight market, the centre provides other services to the community, such as Play Groups, Little Kinda, Kindergarten, Long Day Care, Before School Care, After School Care, Vacation Care Program, Maternal and Child Health and Adult Community Education which includes yoga, Thai cooking and computers. There is also further education on offer and community rooms for hire. All services are of a high standard and will easily accommodate your needs. 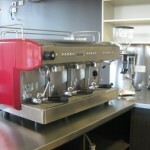 This cafe is part of the centre and will be open during the market. You can purchase snacks and healthy treats which are baked fresh every day. Why not take a break from the market activities, have a coffee and a chat with your friends. Cafe QB also provides a small function catering service, so if you need this for your work or gathering, feel free to ask the friendly staff when you are there. Additional to the products available at the market stalls, there is also face painting, caricatures, magic show, Christmas choir, sausage sizzle and a petting zoo. In fact, there is definitely something for the whole family. 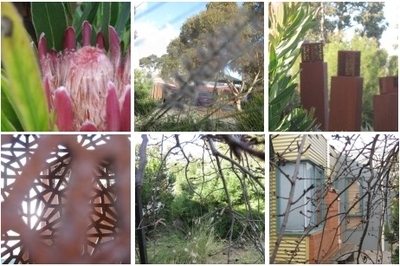 This is not just a community centre, It is a centre for the community!